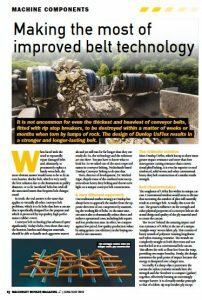 It is not uncommon for even the thickest and heaviest of conveyor belts, fitted with ripstop breakers, to be destroyed within a matter of weeks or months when torn by lumps of rock. The design of Dunlop UsFlex results in a stronger and longer-lasting belt. When faced with the need to repeatedly repair damaged belts and, ultimately, to prematurely replace a barely worn belt, the most obvious answer would seem to be to fit an even heavier, thicker belt, which is very rarely the best solution due to the limitations in pulley diameter, or to fit ‘sacrificial’ belts but with all the associated issues that frequent belt changes entail.